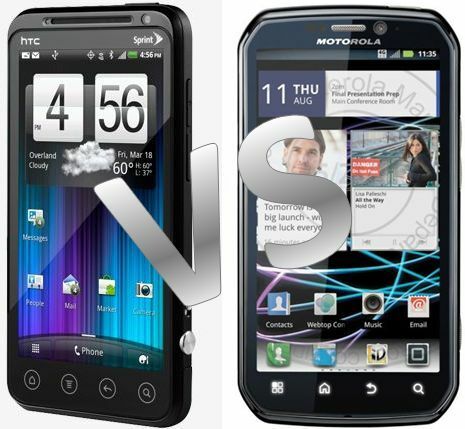 Wanna upgrade your old handset to a new 4G-enabled Android smartphone for taking advantage of Sprint’s speedy 4G network? In my opinion, one of the most notable upcoming 4G-enabled Android-powered mobile phones are the highly-anticipated HTC EVO 3D that allows users to enjoy glasses-free 3D experience while on-the go, and the newly-announced Motorola PHOTON 4G that offers international roaming capability. If you have the same thought with me, and wanna know more details of both handsets to help in consideration of buying either one of them, then the following comparative table of HTC EVO 3D vs Motorola PHOTON 4G might be a quick reference you looking for. From the table above, you may find that both of the contenders feature some similar specifications like same screen size, operating system, nearly same body size and so forth. Anyway, HTC EVO 3D and Motorola PHOTON 4G are actually not even suitable to pitch against each other, since their targeted customer range are different. As Motorola PHOTON 4G is built more towards taking care of business needs with enterprise security and international roaming capabilities, HTC EVO 3D provides users an unrivaled entertainment experience by offering 3D capture and 3D view capabilities. HTC EVO 3D is scheduled to be available through Sprint for $199.99 beginning June 24 on a new 2-year contract commitment, while Motorola PHOTON 4G’s exact launch date and pricing have yet to be announced.